This large paperbark tree is found along the banks of creeks and rivers, swamps and other moist forest environments where freshwater is available throughout the year. Smaller branches have a pendulous or weeping habit. Bark thick, pale tan in colour, papery, peeling off in large sheets. 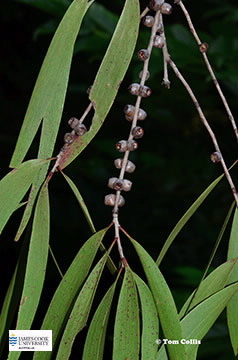 Young shoots and twigs clothed in white or silver, prostrate hairs however, these soon fall off so that leaves are hairless at maturity unlike Melaleuca dealbata which is sometimes called ‘White-leafed Tea Tree or Paperbark, because of the white hairs that are usually persistent. Leaf blades about 11.5-17 cm long x 0.8-2.1 cm wide, with five prominent longitudinal veins. Inflorescences are about 25-30 mm wide, in bottle-brush like spikes. Flowers usually in groups of three within the inflorescence. Stamens about 10-24 mm long, +/- fused in five bundles opposite the petals. Flowers have a strong sweet odour. Fruits are stalkless (sessile) capsules, about 4 mm wide. JCU acknowledges the Yirrganydji and Djabugay Peoples for sharing their Indigenous Knowledge and pay respect to the elders past and present. “Known as Kidi. Paperbark used for shelters, cooking, bandages, torches etc. Medicine made from tree to treat colds and flus. Flowers used for making a sweet drink”.